Desktop PC motherboard ATX power reset switch cable, red green LED indicator, momentary switch button. Each switch and LED is clearly labeled, easy to set up, just connect the cable into the motherboard, the other end of the switch connect to the chassis panel, and you can switch on power or reset the motherboard. Great replacement for burnt out LEDs and worn out switches. Enough length and easily split the wires to make it easier to attach them. PC ATX power supply reset switch cable with 2 LED lights, connector including: 1 x H.D.D LED cable + 2 x POWER LED(Power LED+, Power LED-) + 1 x RESET SW + 1 x POWER SW. 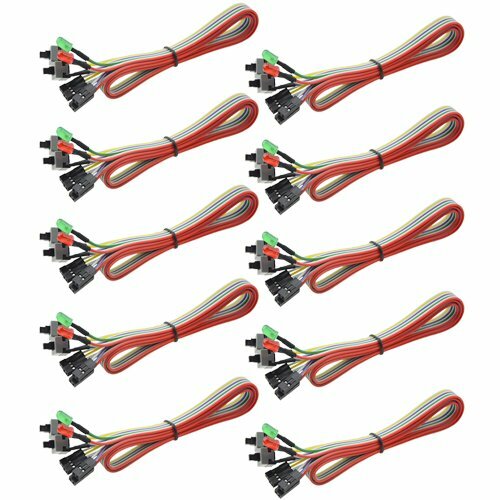 Desktop Computer reset switch cable, come with red green LED indicator, fits most desktop computer host cases with front panel button. Each switch and LED is clearly labeled to make installation easy, great replacement for the front panel switches and LEDs. Package Content: 10 * Desktop computer case power reset cable.